An interceptor missile was launched from Vandenberg Air Force Base, California, on Wednesday. The test failed. 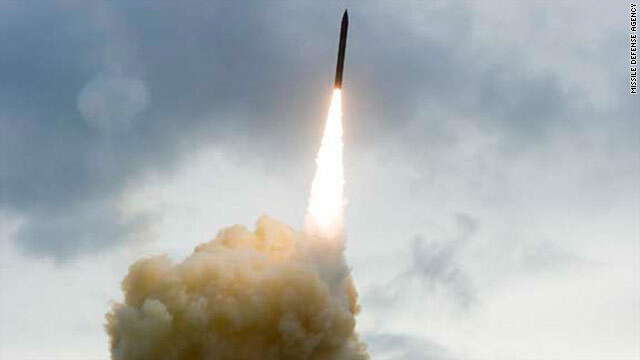 (CNN) -- A test of the United States' only long-range missile defense system failed Wednesday -- the second failure this year in two tries. The Pentagon's Missile Defense Agency said both the intermediate-range ballistic missile target and the long-range interceptor missile launched successfully, radar and sensors worked properly and the "kill vehicle" deployed. But the "kill vehicle" didn't hit the target. "Program officials will conduct an extensive investigation to determine the cause of the failure to intercept the target," the agency said. "The next flight test will be determined after identification of the cause of the failure." The last test, in January, failed because of a problem with the sea-based X-band radar, the agency said. The X-band radar sits atop a modified floating oil platform and provides information about incoming missiles so military officials can launch a response. In both Wednesday's test and the test launched earlier this year, the target missile launched from Kwajalein Atoll in the Republic of the Marshall Islands, and the interceptor launched from Vandenberg Air Force Base, California. The $100 billion missile shield program has had numerous problems. In December 2008, an interceptor launched from Vandenburg "killed" a target launched from Kodiak, Alaska. But the test wasn't able to determine a key aspect -- whether the interceptor could tell the difference between a decoy and a real missile -- because the decoy failed to launch. Riki Ellison, chairman and founder of the Missile Defense Advocacy Alliance, a nonpartisan organization that advocates for the deployment of missile defense systems, said the failure "is a tremendous setback," noting three major test failures in the past two years. Ellison said many of the country's interceptors are nearly identical to the one that failed Wednesday, and he questioned the military's confidence in the ground-based system deployed in Alaska and California. So far, the Defense Department has deemed eight of the program's 15 tests successful.